Located in Pinner, North London the original property had been significantly but poorly extended to the side, rear and roof. JTA were appointed to reconsider the interior and exterior spaces, increase the ground floor accommodation, rationalise the circulation and improve the relationship between all the rear interior spaces and the garden. 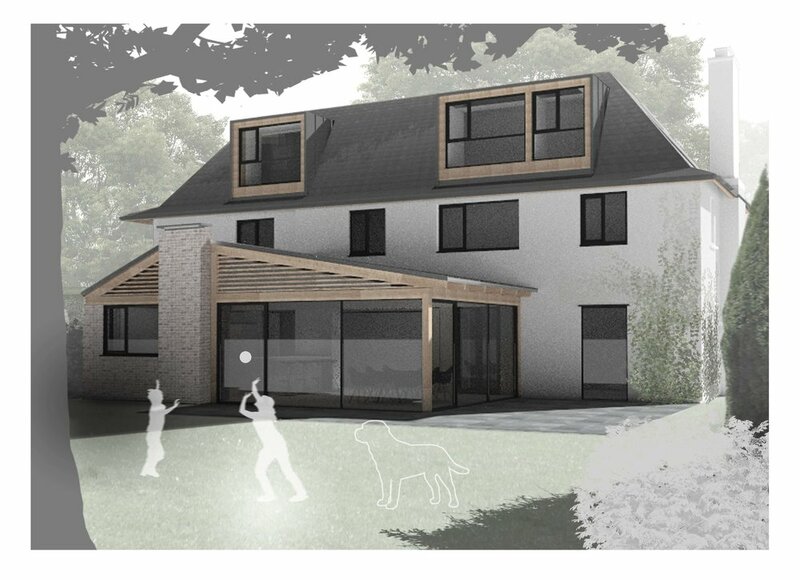 A new rear extension accommodating the kitchen, family dining and living rooms and utility was proposed with the more formal dining and living spaces located at the front. The client wanted a contemporary addition that was sympathetic to the existing house. A large pitched roof with central rooflight created an airy and dramatic volume, which was tempered with the use of natural brick and timber to provide an uplifting, warm and welcoming family space overlooking and embracing the garden. The existing attic conversion was given new life, by moving the staircase and replacing rooflights with larger dormers allowing a more generous feel to the rooms andaffording fabulous viewsover the mature garden. Proposed modifications also included external insulated render to the walls of the existing house and new aluminium framed double glazed units to existing window openings to improve the thermal efficiency of the property.